Practical ambulation must be realized by walking robots to enable social and industrial support by walking robots in human living environments. A four-legged robot that walks through rough terrain effectively does not erase the fact that most legged robots – particularly biped robots – have difficulty negotiating rough terrain. We focus below on a foot structure and landing control for enabling any type of legged robot to walk through rough terrain. When a walking robot lands on the ground, it is difficult to detect the detailed geometry and dynamic properties of the ground surface. The new foot structure we propose adapts to ground surfaces that have different geometries and hardness. The foot has four-part flat soles. The landing controller we apply to a robot with our proposed foot structure increases the stability of contact with the ground. 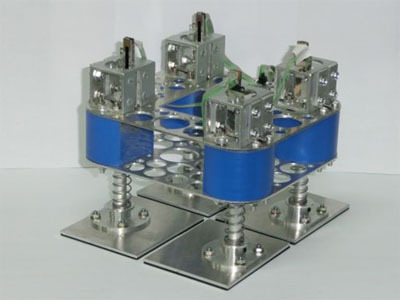 We verify the effectiveness of our proposed foot structure in experiments. S. Mamiya, S. Sano, and N. Uchiyama, “Foot Structure with Divided Flat Soles and Springs for Legged Robots and Experimental Verification,” J. Robot. Mechatron., Vol.28, No.6, pp. 799-807, 2016. K. Hirai, M. Hirose, Y. Haikawa, and T. Takenaka, “The development of Honda humanoid robot,” Proc. 1998 IEEE Int. Conf. on Robotics and Automation, Vol.2, pp. 1321-1326, 1998. K. Kaneko, F. Kanehiro, S. Kajita, H. Hirukawa, T. Kawasaki, M. Hirata et al., “Humanoid Robot HRP-2,” Proc. 2004 IEEE Int. Conf. on Robotics and automation, Vol.2, pp. 1083-1090, 2004. M. Shoji, Z.-D. Wang, T. Takayuki, and N. Eiji, “Foot Mechanisms of Biped Robot for Self-supporting on Irregular Terrain,” J. of the Society of Biomechanisms, Vol.25, No.1, pp. 36-42, 2001 (in Japanese). K. Hashimoto, Y. Sugahara, A. Hayashi, M. Kawase, T. Sawato, N. Endo et al., “New Foot System Adaptable to Convex and Concave Surface,” Proc. 2007 IEEE Int. Conf. on Robotics and Automation, pp. 1869-1874, 2007. J. Yamaguchi, N. Kinoshita, A. Takanishi, and I. Kato, “Development of a Biped Walking Robot Adapting to an Unknown Uneven Surface,” J. of the Robotics Society of Japan, Vol.14, No.4, pp. 546-559, 1996 (in Japanese). T. Sato, S. Sakano, and K. Ohnishi, “Switching Impedance Control in Vertical Direction for Biped Robot with Toe and Heel Joints on Uneven Terrain,” Proc. 36th Annual Conf. on IEEE Industrial Electronics Society, pp. 1639-1644, 2010. K. Hashimoto, Y. Sugahara, H. Sunazuka, C. Tanaka, A. Ohta, M. Kawase et al., “Development of Bipedal Locomotor with Parallel Mechanism – 9th Report: Landing Pattern Modification Method for Uneven Terrain –,” Proc. 23rd Annual Conf. of the Robotics Society of Japan, 1G26, 2005 (in Japanese). E. Nakano, K. Komoriya, K. Yoneda, and T. Takahashi, “Advanced mobile robotics,” Kodansha, pp. 153-170, 2004 (in Japanese). S. Nakajima and E. Nakano, “Adaptive Gait for a Leg-Wheel Robot Traversing Rough Terrain (Second Report: Step-Up Gait),” J. of Robotics and Mechatronics, Vol.20, No.6, pp. 913-920, 2008. S. Sano, M. Yamada, N. Uchiyama, and S. Takagi, “Point-Contact Type Foot with Springs and Posture Control for Biped Walking on Rough Terrain,” Proc. IEEE Int. Workshop on Advanced Motion Control, Vol.2, pp. 480-485, 2008. M. Yamada, H. Maie, Y. Maeno, S. Sano, and N. Uchiyama, “Design of Point-Contact Type Foot with Springs for Biped Robot,” Proc. 2010 IEEE/ASME Int. Conf. on Advanced Intelligent Mechatronics, pp. 806-811, 2010. M. Yamada, S. Sano, and N. Uchiyama, “Landing Control for Biped Robot with Spring Embedded Feet and Walking Experiment on Unknown and Uneven Terrain,” Trans. of the Japan Society of Mechanical Engineers, Series C, Vol.77, No.779, pp. 2734-2741, 2011 (in Japanese). S. Mamiya, S. Sano, and N. Uchiyama, “A New Foot Structure with Springs and Flat Soles for Biped Robot Walking,” Proc. 13th IEEE Int. Workshop on Advanced Motion Control, YF-001546, 2014. K. Terashima, A. Kaneshige, T. Miyoshi, K. Hama, T. Yamazaki, M. Tokuda et al., “Control engineering,” Jikkyo Shuppan, pp. 102-108, 2012 (in Japanese). S. Kajita, F. Kanehiro, K. Kaneko, K. Fujiwara, K. Harada, K. Yokoi, and H. Hirukawa, “Biped walking pattern generation by using preview control of zero-moment point,” Proc. 2003 IEEE Int. Conf. on Robotics and Automation, Vol.2, pp. 1620-1626, 2003. J. Park and Y. Youm, “General ZMP Preview Control for Biped Walking,” Proc. 2007 IEEE Int. Conf. on Robotics and Automation, pp. 2682-2687, 2007.